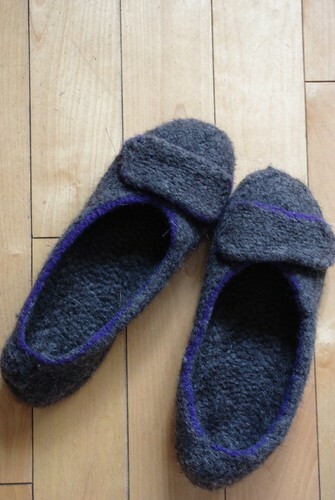 I finished a couple of knitting projects last week, just in time to show them off this weekend. 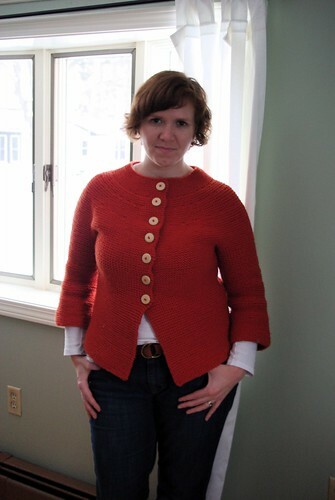 The first one, which which I wore to the NETA SPA- knit & spin retreat on Saturday was the FLOGS jacket I've been showing progress on over the past few weeks. 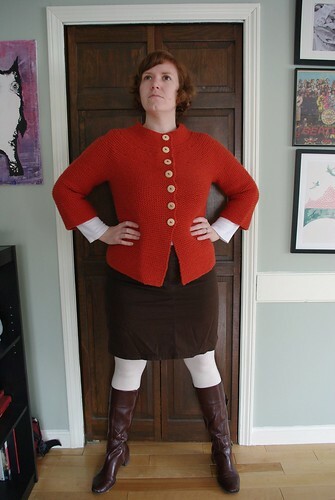 I love the finished sweater. It's super cozy (though it weighs a ton!). 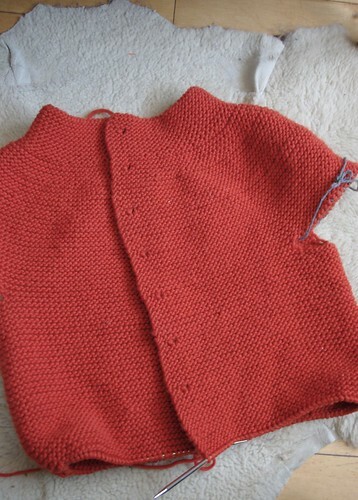 It's knit in Quince & Co. Puffin in Nasturtium, which is the smoothest bulky yarn I've ever worked with. 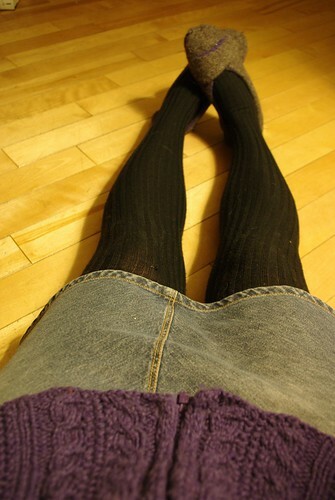 I think the shape is great and rather flattering. 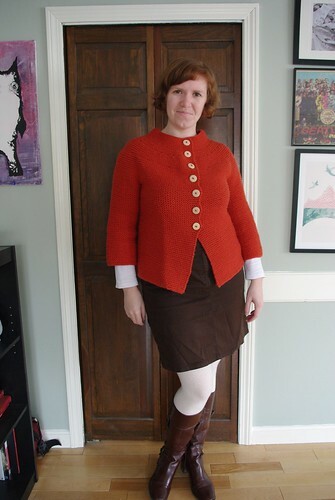 If I made one change, it would be to knit the collar a needle size down, as it lost some of it's stand-up-ness during blocking. 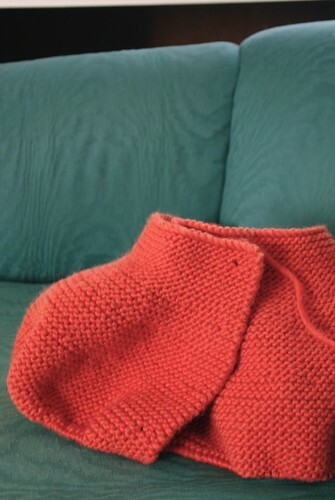 These socks I started knitting in the fall last year as my travel project. I worked on them on my trips to Rhinebeck, Chicago, and Southern California that seemed to happen in ridiculously rapid succession and then didn't pick them up until about a week ago. 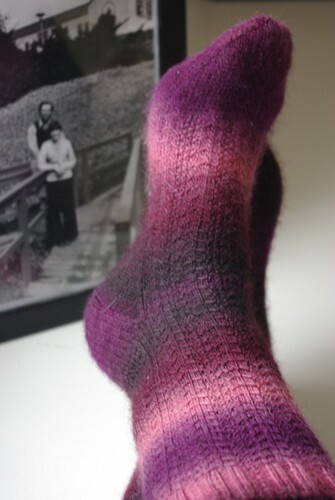 The pattern is the Paul Atwell Socks, which I really enjoyed knitting (when I got around to it). 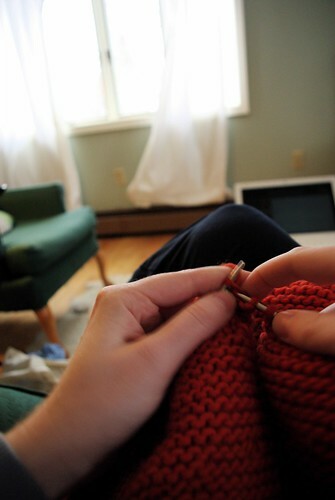 The stitch pattern is easy to memorize, but it has a great effect for so little effort. 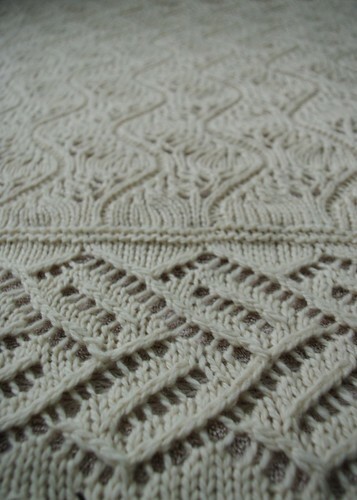 The story behind the pattern (and the Family Trunk Project in general) is worth a read. 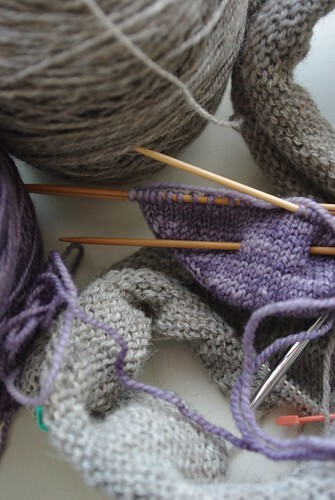 I've already got a new spring-weight sweater on the needles and yesterday I cast on a new pair of socks. Can't have those needles empty, can I? I took the whole thing apart. 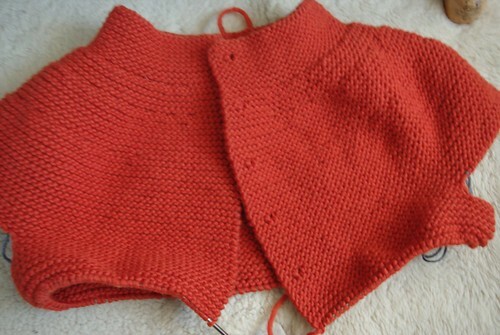 I had swatched, washed and blocked and measured my swatch, but then on a larger scale, my gauge grew and the sweater was just too big. 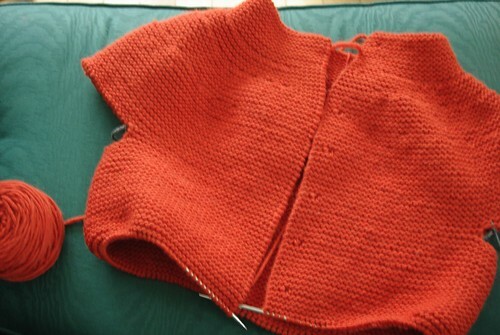 So I frogged it and started again the evening of the 2nd in the next size down. The good news is, it fits great now, and I'm right back to where I left off the first time yarn usage-wise and a little further ahead pattern-wise. 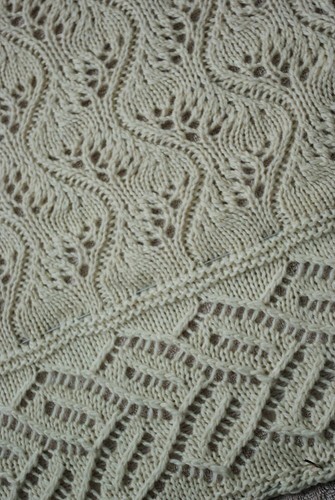 Wednesday night I finished my lace project and put it on the blocking wires. 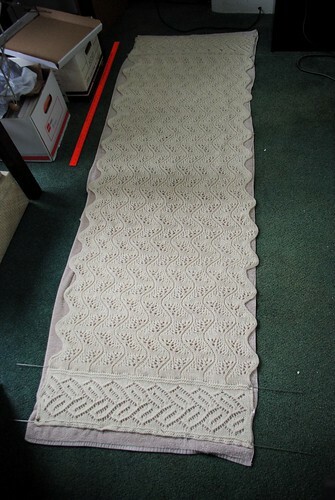 Getting a project like this wet is awesome and terrifying, awesome because the lace really opens up and becomes truly lovely, terrifying because I had no idea how big it might get. (I generally only do gauge swatches for sweaters). Fortunately this "scarf on steroids" project, as I've come to call it, ended up wider, but not substantially longer than the pattern. Not to say it isn't huge anyway - for a sense of scale, the orange strip on the ground is a yard stick. This weekend I'll pull it off the wires and do some wearing demo photos and then it'll be packed up and shipped off to my mother in Northern California. 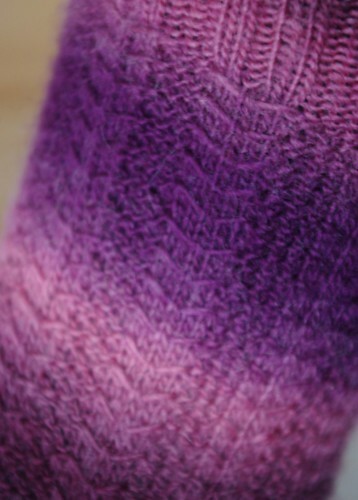 My long-neglected second sock not piquing my interest enough, I immediately cast on a new project (after swatching!) 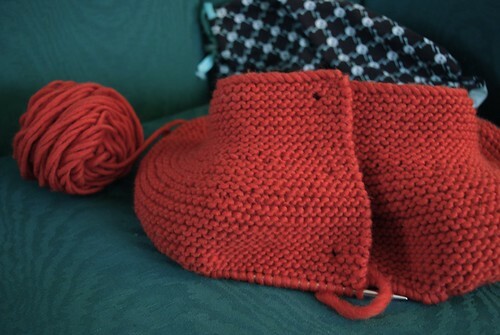 yesterday morning and I've already knit through a ball and a half. 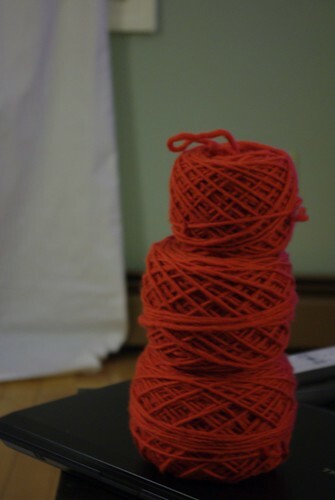 Lord love bulky yarn! !